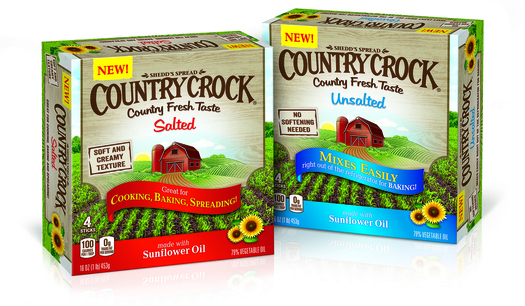 StamfordPlus.com News - Country Crock Taps TFI Envision, Inc.
Country Crock Taps TFI Envision, Inc.
Country Crock® recently tapped the creative team at TFI Envision, Inc. to develop the new packaging graphics for their Country Crock® Buttery Sticks with Sunflower Oil, available as both Salted and Unsalted. Great for baking, they can replace butter one-for-one in baking and cooking recipes. They have a soft and creamy texture and are easy to mix straight out of the refrigerator. “An important step in developing the graphics for these products was to be certain that we maintained the integrity and iconic elements that are key to the Country Crock® brand, while ensuring that consumers would recognize these as new product offerings to meet their needs. We introduced an elegant swooping banner to highlight key usage occasions and demonstrate the versatility of the product offering. The color differentiation - rich red for Salted, vibrant blue for Unsalted - and bright sunflowers in the lower right corner of the front of pack and on the side panels allows for quick identification by the consumer.” said Elizabeth P. Ball, President | Creative Director at TFI Envision, Inc.